Our “Monster” Building with over 23,000 square feet of OPEN SPAN space available with 18 feet of clear space to ceiling beam (10 additional feet in beam space!. Two huge level access vehicle entrances (18ft high x 17ft wide) plus 3 man doors. Direct and level access to parking and entrance to Fairgrounds. Custom Electrical installations available to suit your event. 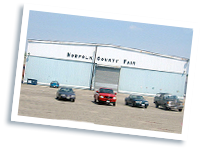 The Norfolk County Agricultural Society gratefully acknowledges the tremendous financial support of the Government of Canada, and Human Resources and Skills Development, in making our 2004 Fairgrounds Renovations possible.